Iceland was at the top of my list when I began planning my travel adventures. Although it might not seem like the ideal place to visit, several factor had added up to bring it into focus for me. I had stumbled across an article about Reykjavik's peaceful revolt against a corrupt government some time ago, and then my cousin went and had only good things to say. Everyone has heard of the Blue Lagoon at some point in their lives. And then there were the instagrams. And the discount airlines. And it's only a 5 hour flight from Boston? You say they have furry viking horses that like hugs?! I was already there, active volcanoes or not. I booked my flight with WOW Air. This budget airline is relatively new, but expanding fast. They currently offer flights out of Boston, D.C., San Francisco and recently added L.A. to their American repertoire. WOW Air offers destinations all over Europe, and they're based out of Iceland itself. You can find flights as low as 99$ from the states to Reykjavik. My only pointer here: When they say it's a no frills airline, they mean no frills. Don't expect any accommodations during your flight and bring your own food. On the plus side, their plane design is really fun and the staff are all super friendly and attractive. Looking for something else? Try IcelandAir, AirIceland or check here to see a whole list of airlines that fly to Iceland. KEX Hostel, for the young and budget oriented traveler. There's no other way to put it; this place is really cool. The interior design is something like steampunk warehouse meets vintage cottage. You can expect mismatched furniture, old maps, chalkboards, floor to ceiling book cases, leather couches, and exposed pipes. I stayed in a 10 bed dorm and it was pretty nice. Comfy beds if a bit squeaky, outlets, and private showers with amazing hot water. The atmosphere is what really shines here. They serve food at the restaurant/bar located in the common room and have a great outdoor patio. This is the place to stay if you're looking to meet people as the nightlife is so good even the locals come here for a drink. The staff is friendly and helpful, and can book tours for you right at the front desk. Most of the tours will come and pick you up right in front of the building, and the airport shuttle picks up and drops off here as well. Prime location in the city with a beautiful view of the water. If you're not sold on KEX, take a look at some AirBnB's. Sandholt Bakery - Decadent freshly baked pastries and amazing coffee, smells incredible, tastes even better. Good for lunch too! C is for Cookie - Perfect for popping into after visiting Hallgrímskirkja, this cafe is warm and full of snacks, hot drinks, and free wi-fi. Bæjarins Bestu - a tiny hot-dog stand in the middle of the city, expect to wait in line for what Condé Naste Traveler calls The One Dish to Eat in Iceland. It may not look like much, but trust me you'll go back for seconds. Icelandic Fish and Chips - A must-do, order their catch of the day. Skúli Craft Bar - Great for craft beers you won't find anywhere else, locals and tourist mingle here. CityWalk Walking Tour - I highly recommend doing this first. These guys are pros (and why are all Icelanders so good looking?). They are extremely entertaining as well as super informative and you'll leave this tour with knowledge of the city, fun facts and history about Iceland (so many active volcanoes), and they are ready and willing to answer any and all questions you may have along the way. Best of all, it's free! Pub Crawl - If you're looking to delve into Iceland's nightlife, look no further. Run by the same guys from CityWalk, they'll take you around to several bars and make you take shots of Brennivín. The night ends at a popular club, which I should probably mention doesn't close until 4am. Golden Circle Tour - Another must do when visiting Reykjavik. There are a bunch of different tour companies that run this tour, so look around and find what's right for you. The company linked is the one I took, and it was a beyond amazing experience. 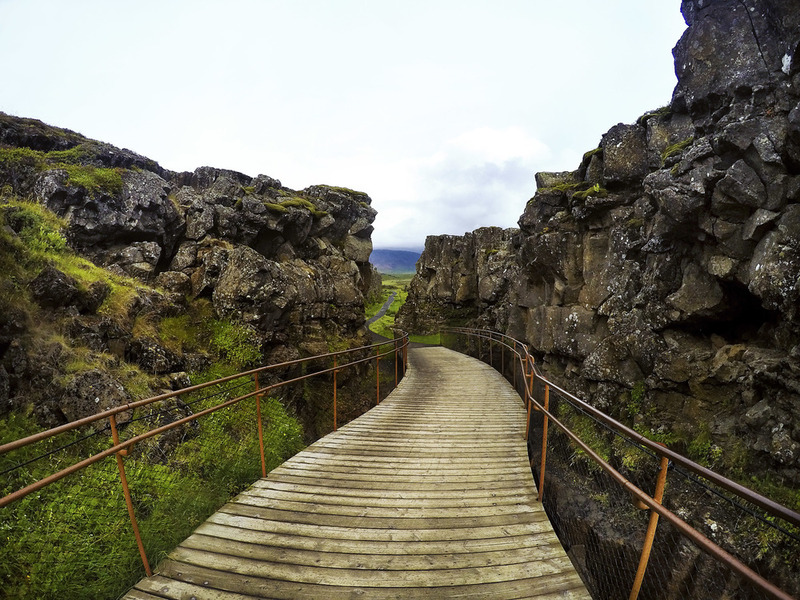 Put aside an entire day and take in the awe-inspiring nature that Iceland has to offer. Huge waterfalls, steaming blue sulfur pools, geothermal energy, a UNESCO heritage site, the clearest glacier water you've ever seen, along with a stunning lunar landscape await your viewing pleasure. Ride Icelandic Horses - This one is for the adventure savvy traveler. Icelandic horses differ from their brothers in their small stature, passive nature, and beautiful majestic manes and furry coats. You will fall in love as you walk and trot along another gorgeous landscape, stopping midway for a picture break and then heading back to the farm and giving your horse a good-bye hug. Blue Lagoon - Is this place a tourist trap? Yeah. Is it worth it? Yeah. Although the vibe is very...overpriced, this famous steaming blue lagoon is one of those once in a lifetime type of things. The water is a milky blue with black sand underfoot and a steamingly warm tempurature; you won't be cold. Get a free silica mud mask or buy a drink from the hut in the middle and swim around. Be aware of how much you're spending. The króna can look like monopoly money, and it's a bit tricky to figure out the exchange rate which does not favor the U.S. dollar. Check the conversion and know that Iceland can be expensive. Do not take a taxi, not even from the airport. Taxis are extremely expensive. There is an easy shuttle bus from the airport that can take you wherever you're staying in the city. Bring a good quality camera. Trust me, you'll want to have more than just your phone. Iceland's weather can vary from day to day, and if you are taking a tour outside of the city you'll want a good pair of hiking shoes as it can get wet. I would also suggest something warm and waterproof, even if you're going in the summer. However, don't lose hope for sunny days. The weather can be beautiful and there were a number of warm days when I was there in mid-August. Be prepared for weird sunlight hours. In summer, they have extra long days. The sun didn't set until past 11pm when I was there. Bring an eye mask! Are you interested in visiting Iceland, or have you already gone? Tell me about your plans or adventures below!